The Hidden Treasure Tote is a mid-sized tote with a mini purse hidden inside for all your essentials. Inside this midsized tote you will find a mini sized purse for all your essentials that stays safely secured in place until you want to take it out for a night on the town. The tote has 2 large front pockets and up to 3 zippered pockets on the back. Don't worry about changing your purse for the evening; everything you need is already in place in your hidden mini purse. Simply remove the mini purse with it's shoulder length strap that has been tucked inside its back pocket. Place the mini purse back in the tote and you are ready for more shopping tomorrow. 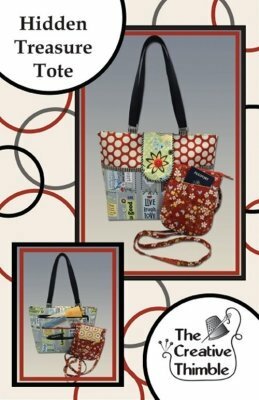 Tote 17in W x 12in T. Mini Purse 7in W x 8-1/2in H.